This is a modified version of an article that appeared in the November 2006 newsletter of the Construction History Society, and is subject to copyright. If you stop almost anyone in the street and ask them what a police box is, chances are that they'll think of the TARDIS from the BBC television programme Doctor Who. But how many could actually tell you what the original police boxes were and what they were for? The history of the police box starts in America. The telephone was invented by Alexander Graham Bell in 1876, and was soon adopted by the police as a communications device. Police call boxes soon appeared in the streets, but were primarily for the use of police officers to keep in contact with the police station. These boxes were literally that - a box containing a telephone mounted on a post, and were used mainly as communications points. In 1881, the Police Patrol and Signal Service in Chicago installed special booths with direct phone lines to police stations. These booths were similar to sentry boxes in style, and keys were issued to police officers and local residents. 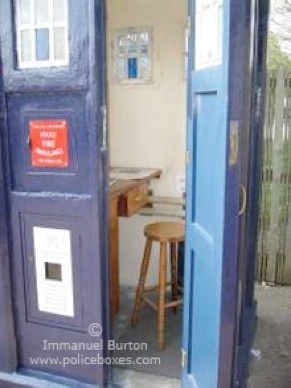 Police boxes were introduced in Britain in the 1920s, but the first designs were not of the TARDIS style. It is reasonably well known that police boxes were used by constables to keep in contact with a central police station, but there was actually more to their implementation than that. Chief Constable Frederick James Crawley of Newcastle-upon-Tyne introduced police boxes in Sunderland, starting in April 1923, to increase the efficiency of constables on the beat. He had realised that much of a constable's time was wasted travelling to and from his police station - for example, a half-hour refreshment break called for a visit to the police station (or any other suitable place), and then a return to beat duty. This meant that up to a quarter of a constable's beat time could be wasted. The police box system was therefore introduced as a means of decentralising the police force. Placing police boxes on the street effectively provided each constable with a mini police station, and it was later found that beat constables did not actually have to make any physical contact with a police station proper. One consequence of this was that some police stations were closed, thereby providing a cost saving. The Newcastle-on-Tyne police boxes were wooden, and were reminiscent of sentry boxes. They were four feet square, and contained a small desk, a stool, electric lighting and a heater. A small compartment containing a telephone and first aid kit was accessible from the outside, and these were designed with public use in mind. These boxes were wooden, and cost £13 each to build. A design life of 15 years gave an annual cost of less than £1. The boxes were held down to a cement bed by four bolts, and the cost of this part of the installation work was £5 - the electric lighting and heating added to this amount. Some boxes, however, relied on adjacent street lamps for internal illumination, and so were not fitted with an electrical supply. Box sites were obtained from the City Corporation or private owners at the nominal rent of 1 shilling per annum. Such was the ease which with these boxes could be installed that in the event of the accidental (or deliberate) destruction of a box, a replacement could be installed within the hour. In 1928, however, Julian Byng, 1st Viscount Byng of Vimy, became the Commissioner of the Metropolitan Police of London, and was impressed by various police initiatives in other parts of the country, including police boxes. In 1929, Superintendent George Abiss and the Metropolitan Police Surveyor Mr Gilbert Mackenzie Trench visited Manchester and Salford to inspect the police box system. Their report was favourable, and the Metropolitan Police decided to introduce police boxes to London. Gilbert Mackenzie Trench designed the well-known police box that is now world famous thanks to Doctor Who. Early boxes were made of wood, but on Trench's suggestion concrete was later used, cast iron having been rejected on account of cost. A pilot scheme saw the installation on an experimental basis of boxes in Richmond and Barnes. A year later, in 1930, a more widespread installation of police boxes (at a cost of £43 each) across London started, and the entire network of around 700 police boxes was completed in 1937. 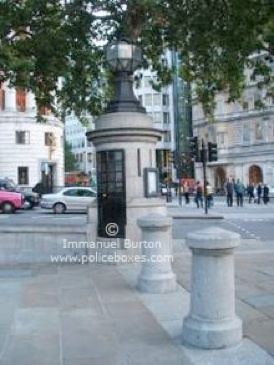 There were initially two types of London police box. The smaller version was known as a police post, and contained just a telephone and a first aid kit, topped by a light. Around 70 of these were installed in the Metropolitan Police District. 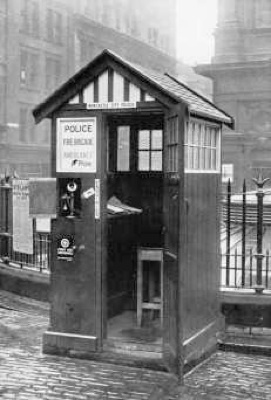 The larger version was the conventional police box, and, like the Newcastle boxes before them, these boxes contained a small desk, a stool, lighting and heating. w were frosted. The panel immediately below the windows on the left door was hinged to allow access to the telephone, and below that panel was a plaque giving instructions on how to use the phone. Adjacent to this sign on the right door was the St John Ambulance Association badge, indicating that the police box contained a first aid kit. On the Mark 2 box, however, the plaque giving the telephone instructions was moved up a level onto the hinged panel covering the phone, and the St John Ambulance Association badge was also moved up one level. There didn't seem to be any standard with regards to the hinging of the telephone panel, so on some boxes it was hinged on the left and on others on the right. The windows opened inwards by about two inches. The Mark 3 design was far simpler, and had no panelling at all, the sides being flat, and with a less complicated window layout. A Mark 3 box still stands in the grounds of the Peel Centre police training school in Hendon, London. It is just about visible from one particular point in the street, but is more easily visible from the London Underground Northern Line between Hendon and Colindale stations. 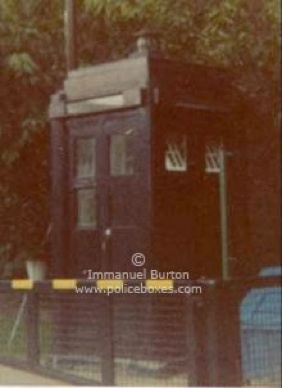 One possible design flaw in the Marks 1, 2 and 3 police boxes was the stepped roof. This allowed water to collect, as adequate drainage had not been incorporated into the design. Although this normally should not be a problem, damage to the concrete could occur if the water was allowed to remain there for too long. In 1931, Percy Sillitoe (later to receive a knighthood and to become director-general of MI5) was appointed as Chief Constable of Glasgow. As part of his reorganisation of the police divisions, he introduced police boxes to Glasgow, and by 1938 there were 323 police boxes installed on the Glasgow streets. Although police boxes deployed in Glasgow seem to be of the Mark 1 variety, the ones installed in Edinburgh around the same time were radically different, and were considerably larger than the London boxes. Between 1931 and 1933, the City Architect, Ebenezer J Macrae, and his assistants A Rollo and J A Tweedie designed a Neo-Classical sentry box, which were made of cast iron by the Carron Foundry in Stirlingshire. In order to comply with black-out regulations during World War Two, special cowlings were designed to cover the roof lights, although the police complained that the overall effect was to render the lights virtually useless. Towards the end of the 1960s, the more widespread availability of telephones, walkie-talkies, personal radios and police radio cars, as well as a general reduction in the number of constables walking the beat, signalled the beginning of the end for the police box. On 4th December 1968 the Working Party on the Removal of Police Boxes met for the first time, and on 20th March 1969 they started co-ordinating the work involved. Tenders for the demolition were received during October 1969, and the work was awarded to the firm of T O'Connor of Maldon Road, Acton. The Memorandum of Agreement for the removal of an initial 40 boxes was signed on 17th December 1969. The use of concrete meant that the boxes weighed around two tons, so many were demolished on site rather than being removed, and the last Metropolitan police box was removed in 1981 from the Barnet bypass. How this box escaped removal for so long is not known, given that it was originally scheduled for removal on 2nd September 1970. Very few of these Metropolitan boxes are still in existence, but one can be seen at the Crich Tramway Village, near Matlock in Derbyshire. A few of the original police posts still remain on the streets in London, most noticeably at Piccadilly Circus. 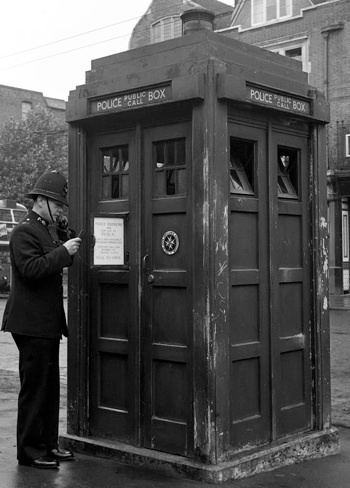 The TARDIS-type police box was not the only style of police box either considered or actually installed in London. In 1937 the Metropolitan Police considered installing "dummy" police boxes on high-accident roads, the Kingston Bypass being cited as one. These boxes would have been labelled "Metropolitan Police Traffic Observation Box", and would have been used to enforce traffic regulations. Motorists would not have known if the boxes were occupied or not, and so would probably not have chanced speeding, etc. These boxes would have been of a different type from the Trench design, but it would appear that this scheme never got past the discussion stage. 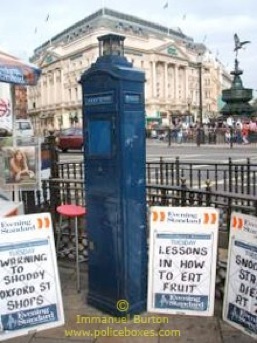 At the south-east corner of Trafalgar Square in London is probably the smallest police box ever put into service. An ornamental light fitting originally installed in 1826 was hollowed out by Scotland Yard in 1926, and a telephone and internal light were installed. Police officers could use the telephone to summon assistance. Nowadays this box seems to be used for the storage of street maintenance equipment. 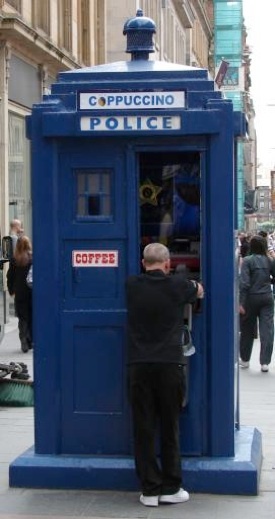 The police boxes in Glasgow and Edinburgh, however, fared better, and can still be seen on the streets. Some, though, have been turned into refreshments kiosks, so in a manner of speaking they are still providing a public service. It would seem that the door has been cut into two halves so that the lower half can remain closed and function as as a sort of serving counter. In the normal run of events, one would have thought that the removal of the last Metropolitan police box in 1981 and the discontinuation of Doctor Who in 1989 would have meant the end of the road for the police box. However, the TARDIS-style police box managed a Doctor Who-style regeneration. 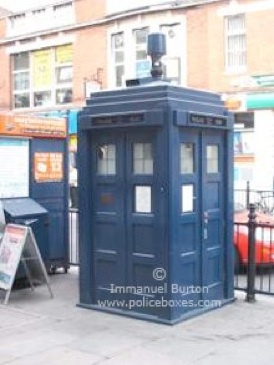 In April 1996 a brand new police box was installed outside Earl's Court Underground Station. The Metropolitan Police filed an opposition to the 1996 application, on the basis that they had originated the design, and that the original police boxes had been used exclusively by the police. Furthermore, there were still hundreds of police boxes in use when the first episode of Doctor Who was broadcast on 23rd November 1963, and so the BBC could not have been unaware of the Police's ownership of the Police Box signage and imagery. To support their position, the Police filed as part of their opposition a drawing dated 12th July 1995 illustrating the design of the Earl's Court police box. The Meteropolitan Police had also granted a licence to two companies - The Once Upon A Time Trading Company and Britannia Miniatures - to produce and market model police boxes. In their defence, the BBC stated that the police box had been associated with Doctor Who since 1963, and that since the mid-1970s a wide variety of merchandise connected to Doctor Who and featuring the police box image had been marketed by the BBC. 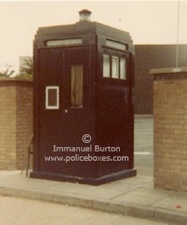 Although the BBC do not appear to have requested permission from the Metropolitan Police to use the police box image, no objection had been raised by the Metropolitan Police for almost 35 years. The final ruling was that the TARDIS-type police box would not have been associated by the public as an exclusively Metropolitan Police item, given that police boxes were used by other police forces, and that some of these polices boxes were of similar design. Furthermore, once police boxes were removed from public use, the only exposure to the public at large would have been on Doctor Who. 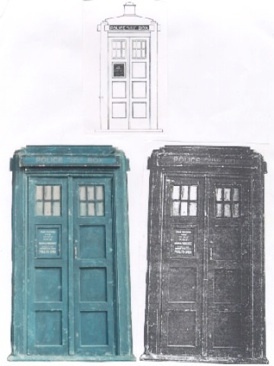 It was therefore deemed that the Metropolitan Police did not have any rights to the police box design, and that the BBC were seeking to register the design as a trademark in association with Doctor Who merchandise. As if losing the rights to the design to the BBC wasn't enough, the Metropolitan Police were ordered to pay £850 in costs to the BBC for having to defend their application. In March 2005 Doctor Who made a spectacular return to television, and so, in a way, the story of the police box continues. The Police Journal, Volume 1, Number 1, January 1928. Severn House Publishers Limited, London, 1983. Chatto & Windus Limited, London, 1989. The National Archives, Kew, Surrey, United Kingdom. Greater London Authority publicity material on Trafalgar Square.